Rated R R for sexual content, language and some drinking - all involving teens. If you’re a child of the ‘80s like I am, John Hughes movies were a major force in defining your youth. You may not be able to recall what you had for breakfast yesterday morning, but you can still recite every word of “The Breakfast Club” three decades later. The brain works in mysterious ways. “The Edge of Seventeen” is a strong successor to Hughes’ legacy with its mix of biting humor and bittersweet heart. With her feature filmmaking debut, writer/director Kelly Fremon Craig hits many of the relatable notes and angst-filled moments that are staples of the teen dramedy genre: the narcissistic sensation that everything happening in your life is super-important, the awkwardness of struggling to forge an identity within the high-stakes pressure cooker of high school. But it’s also darker and truer than Hughes’ films usually dared to be, and it updates his characterizations in ways that are essential for today’s audiences. 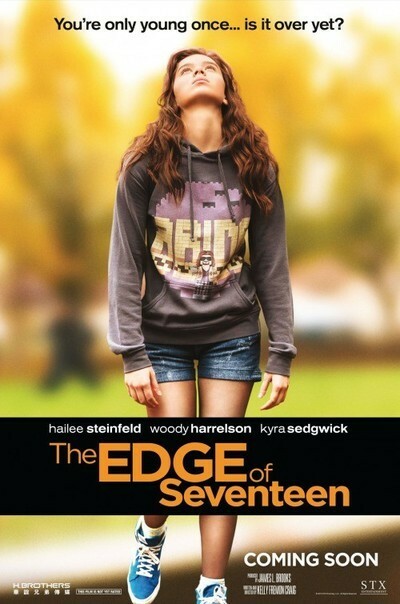 Primarily, though, “The Edge of Seventeen” is a delight, with Hailee Steinfeld serving as the radiant star at its center. An Oscar nominee for the Coen brothers’ 2010 version of “True Grit” and a pop star on the rise, Steinfeld further reveals her versatility as a whip-smart yet socially moronic teenager named Nadine. Her one and only friend since childhood is the perky and slightly better-adjusted Krista (Haley Lu Richardson). Her older brother, Darian (Blake Jenner, so likable as the wide-eyed, freshman baseball player in “Everybody Wants Some! !”), is the golden boy who can do no wrong. Her widowed mother, Mona (Kyra Sedgwick), works hard to support the family as a frazzled, single mom. Every day is miserable for Nadine, as you can imagine it must be when hormones and immaturity won’t allow you to enjoy being the smartest person in the room. She finds a worthy sparring partner for her lacerating wit in her history teacher, Mr. Bruner (a wonderfully understated Woody Harrelson), who dishes it out as well as he takes it and seems undaunted by her insubordination. On the contrary, he actually seems to enjoy their little lunchtime spats. The snappy rapport between Steinfeld and Harrelson make these scenes some of the film’s best. Her other unlikely ally is the sweet, smart Erwin (Hayden Szeto), the slightly nerdy but deeply decent classmate who harbors a not-so-secret crush on her. Szeto is a tremendous find: cute and charismatic, he benefits greatly from Craig’s willingness to defy expectations about high school types. And in creating an Asian character who emerges as both a hero and a heartthrob by the film’s end, Craig rights some of the late Hughes’ wrongs, particularly when it came to broad, ethnic caricatures. Just try watching Long Duk Dong’s wacky shtick in “Sixteen Candles” now without cringing. One of Craig’s many clever touches: The first time Nadine works up the nerve to talk to Nick, Spandau Ballet’s “True” queues up in the background in what has to be an homage to “Sixteen Candles.” Even the trying-on-clothes montage in preparation for her big night with Nick takes place through a different prism than you might expect. And the melancholy tone Craig ultimately sets for this section of Nadine’s misadventures is another great example of the risks she’s prepared to take. Much of “The Edge of Seventeen” is zippy and zingy, but Craig seems just as comfortable taking the story into sadder, more honest directions. She doesn’t necessarily wrap everything up in a way that’s tidy and pleasing. Similarly, much of what makes Nadine so compelling is that fact that she isn’t always nice. She’s capable of laughing at herself for her frequent follies, but her default mode is misanthropy, and she doesn’t suffer fools. She can be mean and impulsive and she’s often the victim of her own undoing. Steinfeld makes this intriguing jumble of contradictions feel real and alive. She doesn’t seem interested in making us like this girl who’s perched on the edge of womanhood. She just tries to make her feel true—and that’s what makes us love her.